We are in the process of gathering all the material on this site concerning Rosalie Bertell and presenting it or indexing it, here. Rosalie Bertell (1929–2012), was an American scientist, author, environmental activist, epidemiologist and Catholic nun. Bertell was a sister of the Grey Nuns of the Sacred Heart, best known for her work in the field of ionizing radiation, weather warfare, electro-magnetic pulse weapons and weaponizing the Earth (making the Earth a weapon). Nuclear Industry cancer jumps from 1 million to 2 billion; include animals & double or triple that. Cancer rates edge from 1-in-2, to 1-in-1. Will you fight for justice? Deaths from high yield atmospheric testing when low yield is included jump from 1 million to 60 million deaths & 100 million cancers. When all nuclear industry deaths, fatal & non-fatal cancers are included, jump is to 1.2-to-2.4 billion victims. If you include animals, the toll doubles or triples. Since fallout radiation is accumulative in the body, and women carry all their eggs from birth, the chances of ingested everyday fallout harming your unborn child increase as your injestion of each radionuclude atom, increases. Epidemiologist counts 1.2 billion fatal & non-fatal nuclear cancer victims: real victims of nuclear industry go untold as a Chernobyl count and as a world count. Despite the authorities attempt at concealment, we can still begin to enumerate the real victims of the nuclear age – Although the calculations and statistics which I have brought to bear below do not include all of the human suffering that has been caused by the nuclear age, a closer look will show that the methodology is adequate for a first estimate of major damage. The magnitude of the harm already caused is startling, and even more so when we realise many types of damage have been omitted from this first estimate. In my estimate, cancer, whether fatal or non-fatal (excluding non-fatal skin cancer), genetic damage and serious congenital malformations and diseases ... will be included in the figures. Other damage is acknowledged but not estimated. Ultimately, whether or not one cares about the damage caused by radiation exposure is ultimately a human, not a scientific question. An unwanted attack on someone's person or reproductive capacity is a violation of human rights — Damage is damage, and causing an unwanted attack on someone's person or reproductive capacity is a violation of human rights. Such damage can be rated for importance, but it should not be arbitrarily ignored. "Statistics are the people with the tears wiped away," stated one of the Rongelap people of the Republic of the Marshall Islands, who 'hosted' the United States Bikini nuclear testing in the 1950s. Story of many tears — This is the story of many tears, and of a hard-hearted mindset that laid down the degree of suffering and ill-health that would be the 'acceptable' price to pay for the world 'benefitting' from nuclear technology. Risk estimates used in this analysis — In order to estimate the real victims of the nuclear industry [as oppossed to those figures enumerated by the ICRP, IAEA and other nuclear apologists], I will take the customary risk estimates, indicate their probable range of error, and then extend the definition to cover related events not recognized as 'detriments' by the nuclear regulators. For example, while the nuclear regulators only take fatal cancers into consideration as 'detriments', others, especially those who endure a non-fatal cancer, may find their suffering equally worthy of consideration. And, limiting genetic effects to live born offspring does not wipe away the tears of a family that has endured a spontaneous miscarriage or stillbirth. Estimating fatal & non-fatal cancer risks — In 1991, ICRP concluded the projected lifetime risk of fatal cancer for members of the population exposed to Sievert whole-body radiation at a low dose rate, was between seven and 11 excess fatal cancers ...and, seven to eight excess fatalities for those in the nuclear industry aged 25 to 64 years. We extend these estimates to non-fatal cancers by estimating the total number of cancers which were used by the ICRP in order to obtain the number of fatalities. We, therefore, estimate 16 fatal and non-fatal cancers if we exclude non-fatal skin cancers, or 36 if we count them. If the estimate of fatal cancers was off by a factor of two then we can double all those numbers. The estimate I use for cancer is 16 per 100 Person Sieverts ...but, the reader can adjust this estimate to suit other inclusions, exclusions or uncertainties. Estimating damage to an embryo or fetus — According to the BEIR Committee [Biological Effects of Ionizing Radiation] 1990 report, a dose of 150 mSv to human male testes will cause temporary sterility, and a single dose of 3.5 Sv will cause permanent sterility. According to the ICRP in 1991, just 5 mSv to the testes will cause damage to offspring – yet this dose was permitted yearly to members of the public, and ten times more to nuclear workers, in all countries prior to 1990. It continues today to be permitted yearly for nuclear workers in most countries. Women carry with them all of the ova from birth which they will ever have — Women carry with them all of the ova from birth which they will ever have. The threshold for permanent female sterilization decreases with age, but in general about 650 mSv is considered to be the threshold for temporary sterility in women. After the Bravo event -- the detonation of a hydrogen bomb at the Bikini Atoll in the Pacific in March 1954 -- the women of Rongelap Atoll experienced about five years of sterility. 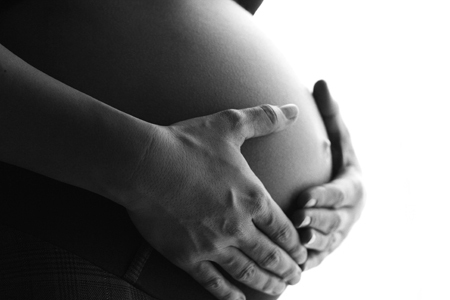 As they regained their fertility, they experienced faulty pregnancies, miscarrigies, stillbirths and damage to their offspring. Since some radionuclides can be retained in bone or fatty tissues, they are able to cross the placenta barrier and disrupt the developing embryo or fetus. Radionuclides in the mother's body can also be transferred in her breast milk. The official nuclear industry definition of 'detriment' includes only serious genetic disease. Teratogenic diseases (those not passed on to offspring) are not judged by the nuclear industy to be serious, and, therefore, not counted as a 'detriment'. Recently, the 1990 BEIR committee made one small concession in recognizing mental retardation — in children exposed to radiation during the fifth to 15th weeks of their mother's pregnancy — Radiation kills brain cells, causing both an underdeveloped brain (microcephaly) and mental retardation. For the individual child, BEIR estimates that a dose in utero of 100 to 500 mSv can cause a range of problems from poor school performance to severe mental retardation. Genetic damage — The U.N. Scientific Committee on the Effects of Atomic Radiation [UNSCEAR] and BEIR both agree that a population of one million live births exposed to 100 Person Sieverts will result in one to three genetic damage effects to offspring, and so to the human gene pool. The doubling dose for genetic effects [the dose that will cause twice as many genetic effects] is more contentious, with some geneticists claiming that it is 2.5 Sv, and others claiming much greater sensitivity with a 0.12 Sv doubling dose. If the latter is true, then the increase in genetic effects will be 8.3 per cent for every 10mSv and therefore 83 such effects per million live births when the total averaged dose is 100 Person Sieverts rather than the 4 such effects in the first instance. On the conservative side, we have taken 10 genetic effects to be the number for exposed offspring. Estimate of 'Teratogenic Effects' — Damage to an embryo from ionizing radiation when in the womb is not considered to be genetic. Such irradiation can lead to 30 different congenital anomolies, including permanent damage to the brain, mental deficiency, skull deformities, cleft palate, spina bifida, club-feet, genital deformities, growth retardation and childhood cancer. A total of all those effects, including mortality, amount to 46, of which 25 are live born. When we summarise those risk estimates, we get 16 cancers, 10 genetic effects and 25 congenital effects for one million exposed to 100 Person Sieverts. The task now is to apply those numbers for the global population from industrial nuclear activities, including weapons testing in the fifties, sixties and early seventies and electricity production from nuclear power over the past half century. When we do this we find that weapons testing has lead to nearly 376 million cancers, 235 million genetic effects and 587 million teratogenic effects to give a total of approximately 1,200 million. Meanwhile, electricity production from nuclear plants between 1943 and 2000 may have lead to another million victims, of which as many one-fifth will have been premature cancer deaths. "Another century of nuclear power, and this carnage would continue with more than 10 million victims a year. An industry which has the potential to kill, injure and maim that number of innocent people – and all in the name of 'benefitting' society – is surely, wholly unacceptable." – Sister Rosalie Bertell, PhD, GNSH, is President of the International Institute of Concern for Public Health, and Editor in Chief of International Perspectives in Public Health (IICPH). "In order to estimate the real victims of the nuclear industry (as oppossed to those figures enumerated by the ICRP, IAEA and other nuclear apologists), I will take the customary risk estimates, indicate their probable range of error, and then extend the definition to cover related events not recognized as 'detriments' by nuclear regulators. "While nuclear regulators only take fatal cancers into consideration as 'detriments', others, especially those who endure a non-fatal cancer, may find their suffering equally worthy of consideration. "And, limiting genetic effects to live born offspring does not wipe away the tears of a family that has endured a spontaneous miscarriage or stillbirth." 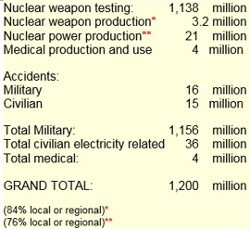 Abstract: A minimum of 1,200 million people have been killed, maimed or diseased by nuclear power since it's inception. The industry's figures massively underestimate the real cost of nuclear power with restrictive rules, in an attempt to hide its victims from the world. Here, the author calculates the real number of victims of the nuclear age. Additionally, Rosalie cites figures on the true amount of deaths and casualties from Chernobyl ...thousands of times higher than nuclear industry regulatory apologists claim. On the tenth anniversary of the Chernobyl disaster, I was standing at a public meeting in Kiev, Ukraine, listening to the story of one of the firemen employed to clean up the site after the explosion. These workers took huge doses of radiation during this task, and their story is a terrifying one. About 600,000 men were conscripted as Chernobyl `liquidators' [also called bio-robots']: farmers, factory workers, miners, and soldiers -- as well as professionals like the firemen -- from all across Russia. Some of these men lifted pieces of radioactive metal with their bare hands. They had to fight more than 300 fires created by the chunks of burning material spewed off by the inferno. They buried trucks, fire engines, cars and all sorts of personal belongings. They felled a forest and completely buried it, removed topsoil, bulldozed houses and filled all available clay-lined trenches with radioactive debris. The minimum conscription time was 180 days, but many stayed for a year. Some were threatened with severe punishment to their families if they failed to stay and do their duty. These `liquidators' are now discarded and forgotten, many vainly trying to establish that the ill health most have suffered ever since 1986 is a result of their massive exposure to radiation. The fireman whose story I was listening to seemed to be an exception to this grim litany of illness and death. He was telling the meeting how pleased and excited he was that, for the first time in ten years, his blood test findings were in the normal range. I was standing next to a delegate from the International Atomic Energy Agency (IAEA) – the organisation charged with promoting the use of atomic energy. On hearing the fireman's story, he leaned over to me and said: "You see! We said these were only transient disorders." A rough translation might read: Chernobyl? What's the problem? The IAEA man's attitude was perfectly in keeping with that of his organization which, along with the International Commission on Radiation Protection (ICRP) exists in practice largely to play down the effects of radiation on human health, and to shield the nuclear industry from compensation claims from the public. The IAEA was set up in the late 1950s by he UN, to prevent the spread of nuclear weapons and to promote the peaceful use of atomic energy – ironically, two contradictory objectives. The ICRP evolved from the 1928 International Committee on X-Ray and Radium Protection, and was set up in the fifties to explore the health effects of radiation and [theoretically] to protect the public from it. In fact, both organizations have come to serve the industry rather than the public. The Chernobyl case is a classic example of the IAEA's inadequacy and questionable science. Despite massive evidence to the contrary, not least from the many thousands of victims themselves, the IAEA insists that only 32 people have so far died as a result of Chernobyl – those who died in the radiation ward of Hospital six in Moscow. All other deaths related to the disaster and its aftermath are ignored; (and, there have been many more than 10,000 in Ukraine, alone ...according to the Minister of Health there). Belarus had the highest fallout, and yet there is an international blackout among the IAEA and the rest of the 'radiation protection community' on the suffering of its people. The essential problem is that both the IAEA and the ICRP are dealing not with science but with politics and administration; not with public health but with maintaining an increasingly dubious industry. It is their interests, and those of the nuclear industry, to play down the health effects of radiation. The main way in which the "radiation protection industry" has succeeded in hugely underrating the ill-health caused by nuclear power is by insisting on a group of extremely restrictive definitions as to what qualifies as a radiation-caused illness statistic. > If a radiation-caused cancer is not fatal, it is not counted in IAEA figures. > If a cancer is initiated by another carcinogen, but accelerated or promoted by exposure to radiation, it is not counted. > If an auto-immune disease or any non-cancer is caused by radiation, it is not counted. > Radiation-damaged embryos or foetuses which result in miscarriage or stillbirth do not count. > A congenitally blind, deaf or malformed child whose illnesses are are radiation-related are not included in the figures because this is not genetic damage, but rather is teratogenic, and will not be passed on later to the child's offspring. > Causing the genetic predisposition to breast cancer or heart disease does not count since it is not a 'serious genetic disease' (in the Mendelian sense). > Even if radiation causes a fatal cancer or serious genetic disease in a live born infant, it is discounted if the estimated radiation dose is below 100 mSv [mSv= millisievert, a measurement of radiation exposure. One hundred millsievert is the equivalent in radiation of about 100 X-Rays]. > Even if radiation causes a lung cancer, it does not count if the person smokes ...in fact whenever there is a possibility of another cause, radiation cannot be blamed. > If all else fails, it is possible to claim that radiation below some designated dose does not cause cancer, and then average over the whole body the radiation dose which has actually been received by one part of the body or even organ, as for instance when radio-iodine concentrates in the thyroid. This arbitrary dilution of the dose will ensure that the 100 mSv cut-off point is nowhere near reached. Congratulations on a generally excellent issue! I have always felt that newspaper articles are too fleeting, and books are too ponderous to reach the public on this important issue; however, you have found a very good imtermediate carrier for the information. Please keep me informed of reactions (which may get nasty). I was concerned about my article, and perhaps there were some attempts to reach me for comments when I was overseas (13 Oct to 2 Nov). It was too bad that important references were omitted, as was the fact that I used only UNSCEAR data on population doses of radiation due to weapons or civilian nuclear enterprises. The text does not mention the source of the population dose estimates, which are fundamental to the credibility. I can also be faulted for the comment (added by someone) that 100 mSv is the equivalent in radiation to about 100 medical Xrays. Nuclear doses are always whole body doses, while medical Xray delivers a partial body dose to the target organ (teeth, chest, kidney, etc.). Speaking about "100 medical Xrays" is pretty vague and useless. I tried to present the results in table form so that you could aggregate them as you needed, but I cannot match the numbers used in the article with my original estimates. The editor exaggerated somewhat the weapon testing contribution and very much slighted the nuclear power contribution. Both calculations were made using the same methodology and both used the official UNSCEAR data. Of these amounts, about 31.4% are radiation induced cancers; 19.6% are genetic effects and 49% are teratogenetic effects in live born offspring.I used official risk factors except for not introducing the dose rate effect which the nuclear people do to reduce the number of cancers. My own research would say that the cancer estimates should be doubled, not divided by two. In the paper I maintained a neutral position by not doing either.